Don’t throw out your photodynamic therapy (PDT) laser yet! While most retinal specialists choose anti-vascular endothelial growth factor (VEGF) therapy as their first line treatment for wet AMD,1,2 there is increasing evidence that a multi-pronged approach may provide the best results for our patients. Choroidal neovascularization (CNV) is stimulated and maintained by VEGF,3 but temporary inhibition of VEGF alone is not sufficient to stop the progression of the disease in most patients. Studies have shown that repeated intravitreal injections of anti-VEGF therapy are required for best results but even then only a minority of patients respond with complete inhibition of the CNV and an improvement in vision. Photodynamic therapy has a different mechanism of action from the anti-VEGF agents. PDT produces thrombosis of the low flow vessels within the CNV lesion. An inflammatory response ensues, along with fibrosis and regression of the CNV.4,5 The effects of PDT monotherapy are transient in most cases, with repeat treatments often administered every three months for the first year. By inhibiting CNV through a pathway different from anti-VEGF agents, PDT in combination with anti-VEGF therapy may reduce the frequency of treatments needed. The limitations of PDT include a low incidence of back pain during infusion (1%), sudden vision loss after treatment (4%), the need for reduced ultraviolet light exposure for five days after treatment, the need for re-treatments, and a preferential effect on the classic subtype of CNV.6 PDT also induces stimulation and upregulation of VEGF after treatment which may actually stimulate CNV growth.7 Sudden vision loss was found to be transient in most cases but still creates concern in the minds of investigators. The lower luminance now advocated with combination therapy (see below) may reduce the frequency of this complication. The rationale for combination therapy stems from the multifactorial etiologic basis for the development of CNV in wet AMD. CNV formation is associated with degenerative changes in the retinal pigment epithelium (RPE) and Bruch’s membrane that are associated with inflammatory mediators produced by macrophages, degenerating cells and ischemia.8 A combination of growth factors and cytokines may affect different components of the angiogenic cascade leading to CNV growth. Different treatment modalities may ameliorate the negative effects of other treatments. PDT, for example, produces thrombosis in the small vessels of CNV but results in a pulse of VEGF release and inflammation after PDT treatment.8,9 By adding anti-VEGF agents, this negative effect on growth factor release may be ameliorated, and the addition of steroids may reduce inflammation, fibrosis and retinal edema. Anti-VEGF agents, in turn, may be associated with a rebound phenomenon of VEGF production 4-6 weeks after initial injection.10,11 Visudyne produces thrombosis of vessels for up to three months or so and may help get the lesion through this rebound phase. Many different combination therapy regimens are being investigated. While the general concept is to use a combination of PDT with intravitreal injections of anti-VEGF agents with or without steroid, the amounts of drugs injected, the order of treatments, and the PDT fluence employed vary. One popular protocol is to combine PDT with an anti-VEGF agent (typically ranibizumab or bevacizumab) at the same sitting with the PDT delivered first and the anti-VEGF agent delivered minutes later. Combination therapy with steroids is more complicated due to volume issues. PDT may be followed by combining ranibizumab or bevacizumab (0.05 cc of either) with dexamethasone (0.05 cc of the 10 mg/cc dose). A total of 0.l cc of volume is generally delivered. In pseudophakic patients without a history of glaucoma, intravitreal triamcinolone (IVTA) may be used in place of dexamethasone and a concentrated pellet of the drug (approximately 12 mg) may be delivered in a volume of 0.05 cc.12 Most investigators are reducing the PDT delivery dose by cutting the duration of exposure in half or by reducing power density. The reported results of uncontrolled series suggest that combination therapy may be associated with a reduced frequency of treatments with visual acuity results comparable to anti-VEGF monotherapy.13-16 In some cases, improvement in vision and reduction in leakage may occur with combination therapy when monotherapy alone is unsuccessful (Figure 1). Figure 1. 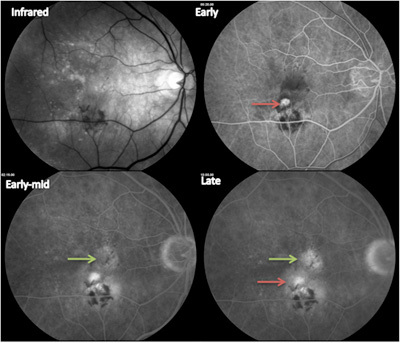 Successful response to triple therapy with PDT with visudyne, intravitreal injection of triamcinolone acetonide (IVTA) and ranibizumab (Lucentis) in a pseudophakic patient who failed monotherapy with ranibizumab. Clinical trials are underway to determine the safety and efficacy of combination therapies and to compare different combination therapy regimens. Goff MJ, Johnson RN, McDonald HR, Ai E, Jumper JM, Fu A. Intravitreal bevacizumab for previously treated choroidal neovascularization from age-related macular degeneration. Retina. 2007 Apr-May;27(4):432-8. Ferrara N. Vascular endothelial growth factor and the regulation of angiogenesis. Recent Prog Horm Res. 2000;55:15-35. Photodynamic therapy with verteporfin for age-related macular degeneration. American Academy of Ophthalmology. 2000;107:2314-7. Tatar O, Adam A, Shinoda K, Yoeruek E, Szurman P, Bopp S, Eckardt C, Bartz-Schmidt KU, Grisanti S. Influence of verteporfin photodynamic therapy on inflammation in human choroidal neovascular membranes secondary to age-related macular degeneration. Retina. 2007 Jul-Aug;27(6):713-23. Gallemore R. NSAIDs in treatment of retinal disorders. Rev Ophthalmol 2006; 13:81. Matsumoto Y, Freund KB, Peiretti E, Cooney MJ, Ferrara DC, Yannuzzi LA Rebound macular edema following bevacizumab (Avastin) therapy for retinal venous occlusive disease. Retina. 2007 Apr-May;27(4):426-31. Gallemore R, Boyer R. High-Volume intravitreal injections in practice. Rev Ophthalmol. 2005; 12:12. Augustin AJ, Puls S, Offermann I. Triple therapy for choroidal neovascularization due to age-related macular degeneration: verteporfin PDT, bevacizumab, and dexamethasone. Retina. 2007 Feb;27(2):133-40. Lazic R, Gabric N. Verteporfin therapy and intravitreal bevacizumab combined and alone in choroidal neovascularization due to age-related macular degeneration. Ophthalmology. 2007 Jun;114(6):1179-85. Ahmadieh H, Taei R, Soheilian M, Riazi-Esfahani M, Karkhaneh R, Lashay A, Azarmina M, Dehghan MH, Moradian S. Single-session photodynamic therapy combined with intravitreal bevacizumab and triamcinolone for neovascular age-related macular degeneration. BMC Ophthalmol. 2007 Jun 7;7:10.